Purchase Now We Sell Fast ! 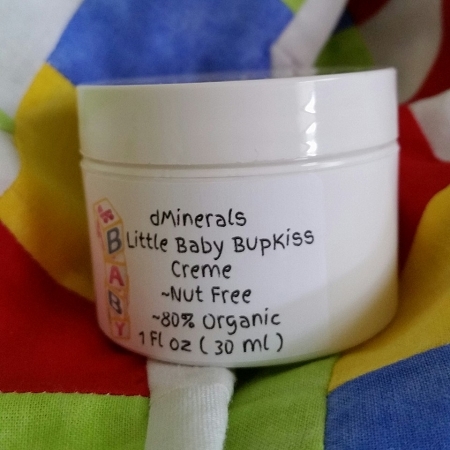 2 oz "Little Baby BupKiss Nut FREE Creme"
Made for baby BUT great for everyone baby-children-teens-women-men-elderly...Anyone with NUT ALLERGIES ! 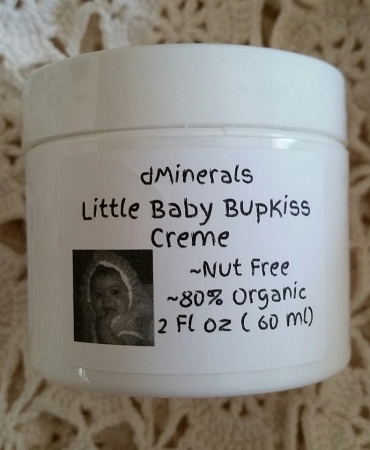 There are NO tree Nut Oils in our Light weight Little Baby BupKiss Baby Creme ! Use it to hydrate and nourish the skin throughout the day whenever you want ! Our LBBC has soothing Organic Aloe, Grape Seed Oil,moisturizing Organic Coconut Oil, and wonderful-wonderful calming Roman Chamomile..Our simple baby cream does the trick when it comes to moisturizing the skin & helping baby feel comfortable and sleeping ! This is perfect for baby or anyone with sensitive skin. 1 oz "Little Baby BupKiss Nut FREE Creme"